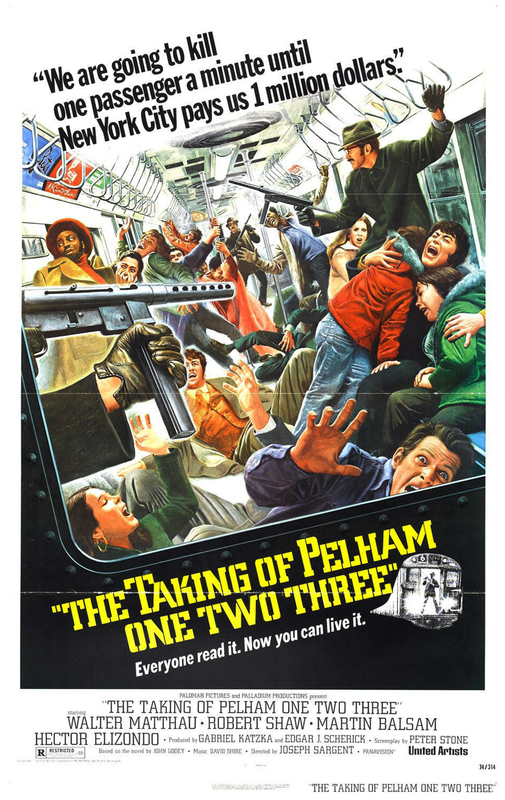 The Taking of Pelham One Two Three (1974) | 'TAIN'T THE MEAT… IT'S THE HUMANITY! I do enjoy a good heist movie, always have. The intricate planning, the recruitment of the gang (all of whom have specialised skills necessary to ensure success), and the inevitable misdirection when something appears to go wrong but is actually all part of the plan. That and the desire to see the thieves pull off the seemingly impossible caper – the more improbable the better – and get away scot-free all makes for great viewing. It’s strange then than one of my favourite heist movies, The Taking of Pelham One Two Three, features none of these elements. First off we don’t witness the formation of the gang as the film begins with the four armed men boarding a New York underground train, taking its passengers hostage and then demanding $1m in ransom. We’re also not privy to the details of their plan, normally a prerequisite for a good caper movie. But the biggest about-face from the standard heist movie is that right from the beginning we’re rooting for the police to succeed and for the heist to fail. This is due in part to the ruthlessness of the gang, led with cold efficiency by Robert Shaw (From Russia with Love, Jaws) while fellow gang members Martin Balsam (Catch-22, All The President’s Men), and TV regular Hector Elizondo (Chicago Hope, Monk) provide back-up and muscle. Another reason for rooting for the good guys is they are led by the ever congenial Walter Matthau (The Odd Couple, Charley Varrick) who plays the New York transit police lieutenant in radio contact with the gang. Matthau in turn is backed up by a large cast of colourful and sympathetic characters, including Jerry Stiller (father of Ben, in his first major movie), Kenneth McMillan (The Stepford Wives, Dune) and Tony Roberts (Serpico, Annie Hall). The movie also takes the time to flesh out most of its characters, even minor ones such as the grumpy Caz Dolowicz and Mrs Jenkins, she of the lost wedding ring. Veteran TV director Joseph Sargent (Gunsmoke, The Man from U.N.C.L.E.) keeps the action rattling along from the beginning and right up to the film’s memorable final scene. And the movie’s main action sequence, the race against-the-clock counting of the ransom and the breakneck drive across Manhattan is skillfully handled and given extra heft by David Shire‘s raucous, brassy score. Despite the movie’s gritty plot The Taking of Pelham One Two Three also features a great deal of comedy relief that Sargent never allows to undermine or overpower the film’s tension. Matthau’s ill-treatment of some visiting Japanese guests only to later discover that they speak perfect English is genuinely funny (Matthau is at his dead-pan best here) as are the scenes with the city’s unpopular Mayor. And the running gag of the wino hostage who sleeps through the entire ordeal is a nice touch. All-in-all The Taking of Pelham One Two Three is a memorable piece of Seventies cinema, action-packed, violent and, at times, very funny. The film has been remade twice, once in 1998 with Edward James Olmos and Vincent D’Onofrio and again in 2009 with Denzel Washington and John Travolta. However both versions are pretty dire and are no where near as much a fun, or as thrilling a ride, as the original. Definitely one to catch.